"This recipe is a mixture of a few of my favourite things from Italy", says Henrietta Inman. 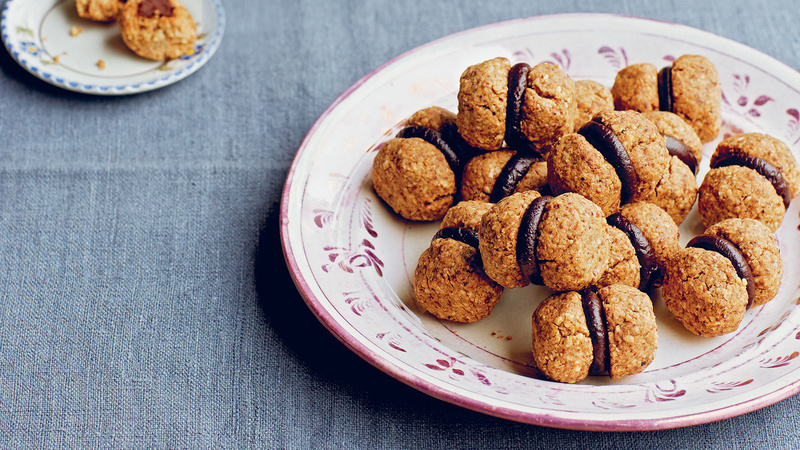 In her cookbook The Natural Baker, she goes on to describe how they are inspired by "heavenly biscuits called baci di dama ('ladies' kisses'), and some lovely chocolates called baci ('kisses') with a dark chocolate shell and chunky hazelnut centre." We reckon just one bite of these baci will transport you straight to the sunny café terraces of Italy, but don't hold us to that. If you can't find oat flour, used rolled oats and process them in a food processor or high-speed blender until they are as fine as possible. Arrowroot is available in most supermarkets and health-food shops. Roll into 36 balls, each about 1 tsp in size, and press each one in the palm of your hand, slightly rolling and forming it to make smooth rounds. Place on the prepared baking tray, go around the edges with your fingers to neaten them up, then press each biscuit gently with a fork. Bake for 8-10 minutes, until light golden brown; the surfaces will have just begun to crack. Leave to cool, while you make the ganache. Place the chocolate in a small heatproof bowl. Bring the cream just to the boil, add the liqueur, if using, mix, then pour over the chocolate. Stir with a spatula until the chocolate has melted and the ganache is smooth and emulsified. Place a piece of cling film directly on the surface of the ganache and leave to firm up in a cool place for about 30 minutes. Turn half the biscuits over so their flat sides are uppermost. When the ganache is set but still soft, using a couple of teaspoons or a piping bag, divide it over this half of the biscuits, spreading it on their flat sides. Place a plain biscuit on top to make a sandwich, press a little, then leave to set in a cool place. There will be some ganache leftover. Rolled it into truffles and coated with cocoa powder or use as chocolate spread on toast (it stores in the fridge for 1 week). These keep well for a good 5 days in an airtight container in a cool place. You can also form the biscuits and freeze them raw for at least 1 month, then bake them from the freezer, allowing a few extra minutes’ baking time.